It was International Womens day last week. An event that passed by more or less unnoticed in these parts. But it got me reflecting on the changes to the status of women in my lifetime and also got me thinking who had been the most influence on my feminist approach to life. I was brought up in the 1950’s by two loving parents, but contrary to popular myth, my mother and her three sisters did not have the traditional role of stay at home to look after the children, but all worked. This was a legacy from WW2 when they had been conscripted into the war effort, but also I think for economic reasons working class women have always worked. Either in the mills and factories or taking in washing at home. Quite frankly as a child I regarded mums who stayed at home as lazy!… maybe this is where my feminist attitudes started to form. 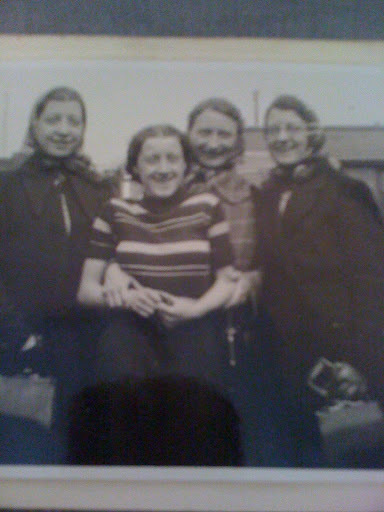 My mum and her three sisters were all very close. 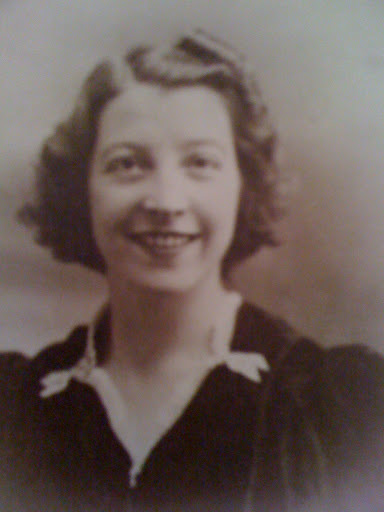 All having been left alone while thier husbands went off to war, so I had a lot of contact with my aunties, particularly Grace, who had no children of her own so spoiled all us nieces and nephews. She was beautiful in both looks and temperament. I was encouraged in education by both my parents. No sense of inequality here, but at school there was discrimination. Girls were not allowed to do woodwork, (which I desperately wanted to do as I regularly helped my dad with jobs) and boys were not allowed to cook. Girls were encouraged to take up more “feminine” arts subjects rather than sciences. Even in employment, women got paid a smaller wage for exactly the same job and in some professions were expected to leave if they got married or had babies! Women were no longer constrained by their fertility. but even then old attitudes died hard. I well remember going to a family planning clinic in1967, I had to pretend to be married and have written permission from my “husband” for me to get the prescription! Silly things like, …my being refused entry to a nightclub on New Years Eve 1967 because I was wearing a silk trouser suit ….and no pub would ever serve me beer in a pint. I had to have two halves! These just reflected the attitudes of males to women’s place in society. Today women expect to have careers and to earn an equal salary. They expect their partners to share childcare and housework. Sadly the men do not always agree or co-operate, and women are finding out about the myth of superwomen, who cannot be the perfect mother and also work full time, somewhere, something has to give. But back to my influences. No great icons shaped my view. I just grew up with a sense of equality. When I explored my genealogy later in life I discovered I came from a long line of strong women. Mostly single parents who had been left by widowhood or desertion to bring up their children alone. They did not sit back and cry but seemed to get on with life and even make a success. So this ethos of equality and self sufficiency was passed down through my genes. A rare picture from 1908 of my paternal grandmother ( front right) Great Great Grandmother (bottom left.) 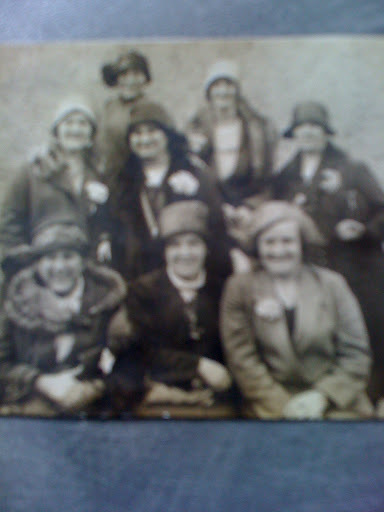 and my Great Grandmother (centre row centre) with the other female member of the family. 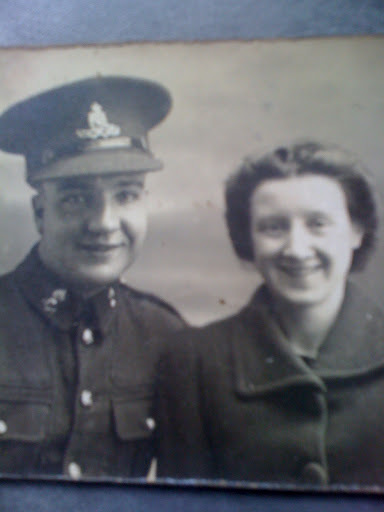 But of course I must not forget my Father, who in the 1950’s was a hands on dad, loved me unconditionally, treated me and my mum as equals, encouraged my education and did not fill me with any nonsense about male superiority. Grrr, I wrote a long comment that disappeared when I moved my cursor to the wrong spot on the page!Anyway – this was a lovely post, Denise. 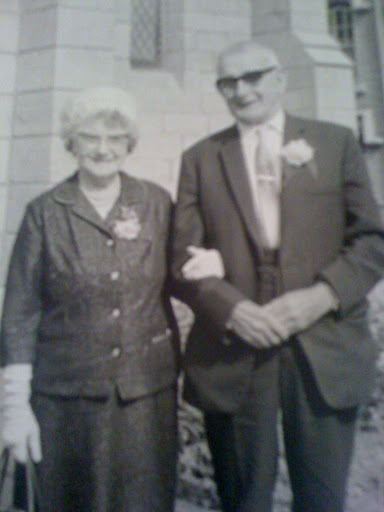 I loved seeing the photos of your ancestors and hearing about what life was like for you growing up in England. You're very fortunate to have had parents who raised you to be a strong and capable woman.I'm glad that I was able to take a woodworking class instead of a sewing class when I was in high school. I still have some of the things that I made – I'm not sure if this would be the case if I had taken sewing! I did eventually take a woodworking class in 1980. Sadly my dad died suddenly aged 58 in 1978 and never saw my work, but I know he would have been proud….Like you Mary Kay I still have the pieces I made unlike the stuff I made in needlework class at school. Reading this again today, I also get very emotional remembering the wonderful women in my life.Jo, when I read the accounts of the right wing, sexist, attitudes being promoted by the Republican party in the US, I can hardly believe these ideas are coming from somebody who is seriously trying to be elected as president of the USA. One of the most powerful countries in the world. It is frightening… and actually, rightly or wrongly paints a very bad picture of the US to the rest of the world.No candidate here would even dare whisper some of this outdated nonsense here. They would be considered, extreme, marginal, minority and not get any of the women's vote.